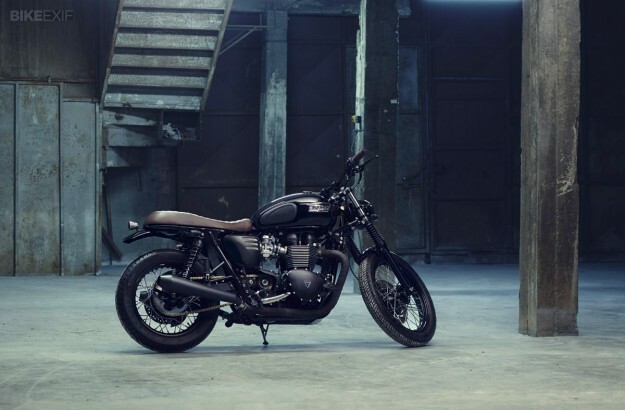 Our most recent Top 5 feature showed just how versatile the Triumph Bonneville is as a custom platform. The venerable Bonny makes for as good a flat tracker as it does a café-racer–so it’s easy to forget what a fine looking motorcycle it actually is in stock trim. 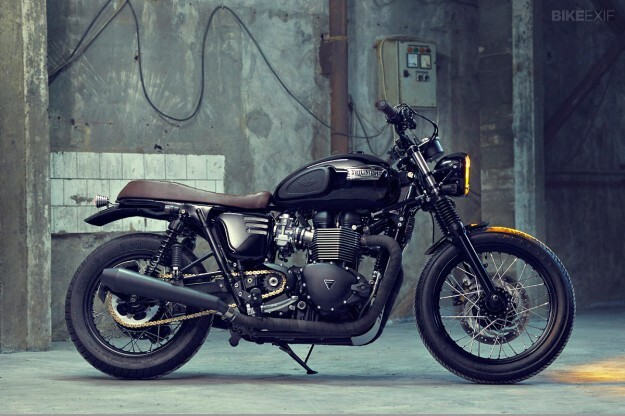 This 2013 Triumph Bonneville T100 Black, from Turkey’s Bunker Custom Cycles, proves just how much can be achieved with a well thought out nip and tuck. As the name implies, the Black comes from the factory with a predominantly black color scheme–right down to the engine and wheels. 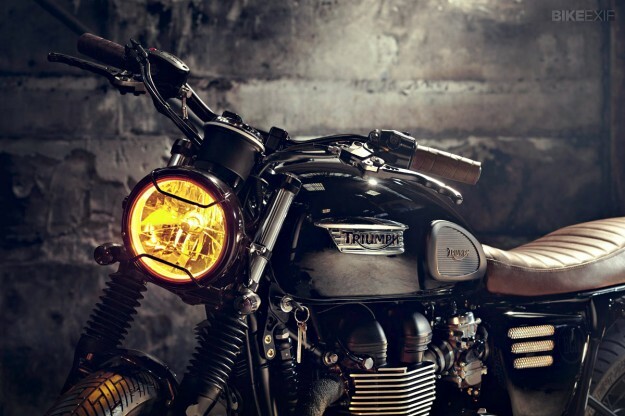 “The T100 was already a very pretty looking bike when its owner brought her to our garage,” says Bunker’s Mert Uzer. He and his brother Can decided to focus on improving the bike’s visual balance as much as possible. After sketching out their ideas they set to work, starting with the rear of the bike. The stock fender and taillight assembly were ditched before the subframe was shortened and finished off with a loop–which was then trimmed to allow access to the seat mounting bolts. To give the T100 Black a slightly more aggressive stance, the brothers installed 1” longer-than-stock Progressive Suspension shocks, before fabricating a new seat with a slight bump in the rear. 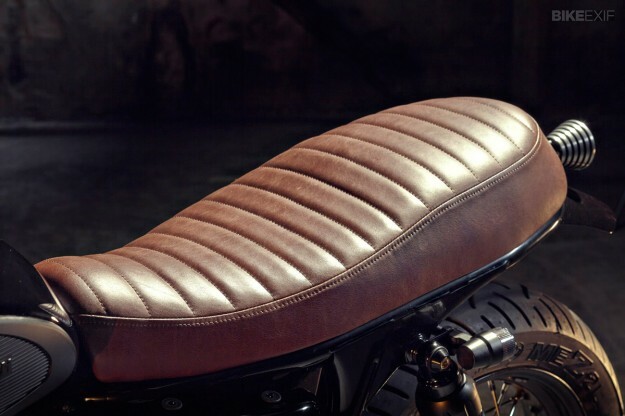 The seat’s been upholstered in brown leather and features a Luimoto Gold Gel pad, inserted under the cover for added comfort. They then fitted hand-made aluminum fenders and a gorgeous one-off taillight–turned in a lathe and designed with polished fins to echo those on the engine. The airbox was removed and K&N filters added to help the engine breathe better. The silencers are British Customs Predator units, and there’s a new Dynojet Power Commander wired in. After re-mapping and dyno-tuning, the Bonneville is now good for 68.7hp and 71Nm of torque. To accompany the new filters, Bunker cut slits into the standard side covers and lined them with an aluminum mesh backing. They also trimmed the front sprocket cover and fabricated an engine guard. Other touches include a yellow lens and bespoke guard for the headlight. 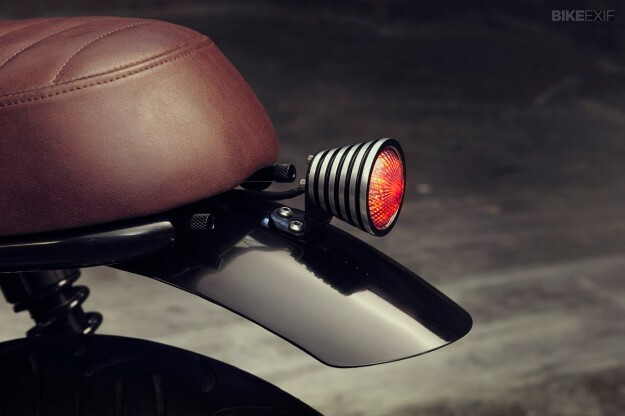 The turn signals have also been relocated and low-rise Biltwell bars fitted, with grips wrapped in the same leather as the seat. The factory black paint scheme turned out to be the perfect match for the Uzer brothers’ well-executed mods. 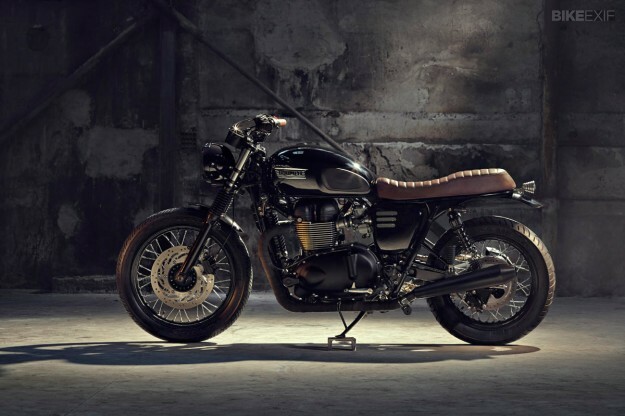 The result is a refined, yet brooding Bonneville T100 that’s begging for a nighttime cityscape to blast through. Photos by Onur Aynagoz. Follow the adventures of Bunker Custom Cycles via their Facebook page.